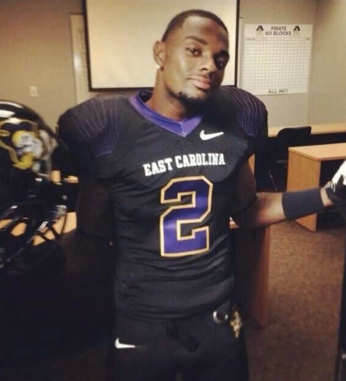 Do not scroll down any further if you want to wait to see the new uniform as unveiled in the completed ECU Video. Love or hate the latest campaigns by the ECU Sports Marketing machine, I gotta at least give them props for their efforts. I was kind of “meh” on the new intro video unveiled on Saturday, but my understanding is that both the players and the student fans LOVE it…which then makes me happy in hind sight. They took a chance, probably knowing that a portion of the fan base wouldn’t dig it. But, I appreciate the need to pull in the younger fans and when the players love something, it typically will become contagious. As an older fan/alum, I appreciate also that they left Purple Haze alone. If former Coach Steve Logan has a legacy that simply works, it was his love for classic rock and the connection to the classic Jimi Hendrix song that has become so identifiable for ECU football. SPOILER ALERT: Quick, close your eyes if you don’t want to know. 247Sports had our 6 on this scoop…showing off the new unis. Sticking with the players, I have to say, watching Paint it Black promo currently going, for me, the promo is a HOME RUN, for several reasons. First, the idea that a school encourages their fan base to where all white, all black, all any color is an old concept and potentially borders on such a “me too” philosophy that it instantly could become stale, or passe. So, if you are going to do one of these things, it has to be different…there has to nuance…an edge. Second, coming off a closer-than-expected but very entertaining win on Saturday and then having a short week to host FAU in a Thursday night, classic trap game, there needs to be something to help the fan base re-charge quicker. It is über important that we show a packed house for a nondescript opponent on a Thursday night when we have the national audience basically to ourselves. And, third, there needs to be energy behind the Black Out…can’t just be the students. The stadium now needs to look completely black young and older fans alike. So, with this latest build up promo (see it here: Paint it Black!) that ECU has going, all I can do is sit back, say “bravo guys/gals” and enjoy. They nailed it IMO, starting with the first cut being the players reactions to the seeing the uniforms (that are out of the frame). Stroke of genius. It pulls you in right away because they love it so much and it connects to the new intro video as well, placing the focus on the players – where it should be. The idea, of course, is then to show a little more each day of the actual uniform, the slow, tease approach, which then keeps everyone focused on the next version of the vid which not coincidently, gets more frenetic each day closer to Thursday night. The idea being, get them worked up to game night where we gain immeasurably from having a sea of black in a full stadium on national TV. Genius! And, the bent while not totally new and unique, is well designed to add some kick to the run-of-the-mill [insert color here]-out that schools are doing everywhere. The staying power and the follow up is critical. For example, while there were several schools who invited a sick child to participate in the spring game, from what I can gather, ECU was the only one to do follow up reports on the child…adding depth and real connection to it rather than grabbing the national attention and headlines only to let it sort of Peter out afterwards. The follow up lends credibility. Credibility reflects sincerity. Sincerity makes the event palpable, which then fuels a tighter bond between the fans, the school, and the team. We are Family could easily be added to our pre-game tune selection as the culture here truly is family. 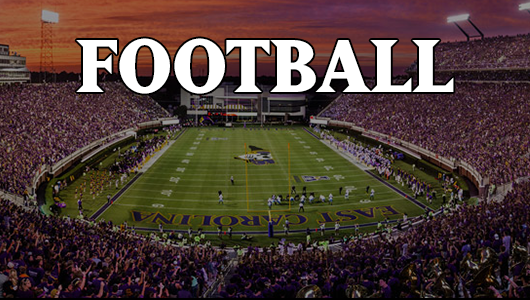 This is a point ECU’s sports marketing is getting loud and clear and their work reflects it along with some high energy and keen insights into the culture. Kudos! And keep them coming…we need to enter the AAC with all cylinders hitting. RC…all I can say is.. 2 thumbs up on that design! Plus if the players feel good about it then they will show it on the field. Thursday night, every Pirate fan needs to don black for a fox sports 1 tv audience. Be loud, be proud, and be a Pirate! ARRRGGGHHH! Always happy to have your comments here. I totally agree…if the players like it, it works for me. I read on BB that someone had talked to Ruff and he said his phone is blowing up over the black unis…I am assuming he is inferring that the recruits are psyched about it…and recruits (teen-agers) don’t always have a good rationale for their choices, so if NIKE black unis get a kid into the ECU camp…I am for it. I have always said, ECU needs to probe the cutting edge more than others from a media/marketing perspective to increase our brand awareness and interest kids that are of a higher athletic cut…looks like they are putting in the effort. I hope to see a sea of Pirate Black on Thursday night. Thanks for checking in BBG. Count me as another “older” Pirate happy to join in on the “Paint It Black” concept. It certainly seems to have captured the interest and attention of the Pirate Nation. Please permit me one observation on your reference to FAU as a “nondescript opponent”. That carries a derogatory connotation that I am sure was unintended. Given our heritage and trials over the years, I would suggest it might be better to call these Owls a new opponent that we don’t know much about yet. Hi Chesapeake, glad to see you stopping in! Point well taken on your observation. It was intentional, but only to intensify the importance of the ECU mindset heading into a game against this new opponent whose profile is not quite to where we are yet with high-profile Virginia Tech on the horizon for the very reason you cited, our history of being the picked on team who refused to go away. But, I get the lesson learned that we should embrace teams whose road is or will be similar to ours…this is why I am happy for ODU and Charlotte even though they are in our recruiting zones and feel for Appalachian State whose on field performance in passion for football deserved better than what they received from CUSA. Thanks for reading and more importantly for dropping a note Ches…it means a great deal. Need to hear from you Ron after the big win. you got it…now…share – in detail – your thoughts on that game – in terms of the long-term impact on the program!